It’s a nightmare that doesn’t end for the family of 24-year-old Marek Lapinski, who suffered cardiac arrest recently during the removal of two wisdom teeth in a southern California oral surgery clinic. The former college football player had no known health problems prior to the surgery, but died three days later in a hospital intensive care unit. While the circumstances of Mr. Lapinski’s death are still being investigated, the case highlights a critical issue. Sedation and anesthesia carry risks, no matter how routine the surgery may be. Patients are entitled to full disclosure about the qualifications of the personnel who will administer sedation or anesthesia for any procedure, and to a complete discussion of the risks and benefits of the type of anesthesia that will be used. There may be minor operations, but there are no minor anesthetics. Anesthesia that is given in hospitals is tightly regulated, but office-based surgery and dental clinics are not necessarily held to the same standards. Regulations vary from state to state. Perhaps the most worrisome aspect is that the same physician or dentist who is performing the surgery may be in charge of the anesthesia as well, directing an assistant who has no formal anesthesia certification to give powerful sedative medications. According to a Fox 5 interview with Mr. Lapinski’s family, he began coughing during the wisdom tooth surgery, and then received propofol, a potent surgical anesthetic medication. Shortly thereafter, the oxygen levels in his blood deteriorated, and he went into cardiac arrest. His medical records were made public by the family, showing that Mr. Lapinski received other sedative medications including fentanyl, midazolam, ketamine, and methohexital in addition to propofol. 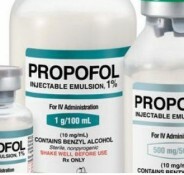 Propofol, of course, is the medication that became famous when it was associated with Michael Jackson’s death. It can be a very safe medication in the right hands, when appropriate monitoring is used and the patient’s breathing is carefully safeguarded. But a patient may easily become so sedated that the tongue relaxes and falls into the back of the throat, causing heavy snoring which can worsen into complete airway obstruction. Unrecognized, complete airway obstruction can lead to oxygen deprivation and death. This problem can be corrected by appropriate use of airway equipment and ventilation, if necessary, but first it must be diagnosed in time. Anesthesiologists are physicians who undertake years of training to become experts in sedation, anesthesia, and airway management. All surgical cases–especially those involving the mouth, throat, and airway–require vigilant care when deep sedation or general anesthesia is used. Whether surgery takes place in an office or a hospital operating room, the presence of an experienced, qualified anesthesia practitioner is critical to the monitoring and safety of an unconscious patient. Is the office the right setting for the procedure? Does the patient have other significant medical problems that might make it safer to perform the procedure in a hospital? Who will be giving sedation or anesthesia, if needed, and who will be monitoring the patient? What type of sedation or anesthesia is planned? Is the office prepared for an unexpected emergency? Are emergency drugs and equipment available? Is anyone on the staff certified in Advanced Cardiac Life Support (ACLS)? If additional medical care should be necessary, to which hospital would the patient be transferred? Who will monitor the patient’s recovery and supervise discharge home? Patients and their families have every right to ask questions before agreeing to have procedures involving sedation or anesthesia in an office setting. For more information on safe office-based surgery and anesthesia, please visit the websites of the ISOBS and the American Society of Anesthesiologists. Propofol for tooth extraction? Isn’t that overkill? I just had two teeth removed and a couple lidocaine infiltrations were more than enough. This is pretty alarming, that dentists are using such powerful drugs when other, safer, drugs are at hand. Lord almighty – since when are dentists using methohexital and ketamine??? That’s definitely overkill. I actually think propofol CAN be used in clinic settings by non-anesthesiologists but not without a good deal of training and ideally not without someone immediately available to intervene if necessary. For wisdom teeth? With a good nerve block? Bad idea. I would like to know who was the anesthesia provider and what was the level of training. I have routinely done outpatient sedation in pediatric population and know one has to be extremely vigilant at all times even after “the case is done”. Pls keep necessary Resuscitation kit always with you.. Kindly undergo ACLS (preferably AHA training)yourself.Dont use more than one sedative at a time. Most of the time, just a Bag mask Ventilation saves Life.